Watch one of our own put the M&F barbell complex to the test...with a little help from a powerful pre-workout. Barbell complexes – several exercises done consecutively with the use of a single, loaded barbell – are one of the most effective training methods for anyone looking to get fitter, faster, stronger or leaner. But, of course, there’s a catch: they are hell on earth (if done with a maximum effort). M&F Editor Mark Barroso took on the Barbell Complex below… but first he took down two tablets of Out of the Lab’s Thermosterone. An hour later he was ready to put the barbell complex—and the Thermosterone—to the test. Limit rest between exercises. Rest 1-3 minutes between sets. Do not exceed four sets. Get more barbell complexes HERE. So what were the results of Mark’s Testing Ground challenge? The barbell complex builds muscle while torching fat at the same time, all in under an hour. So it’s no surprise the workout left Mark sweating. 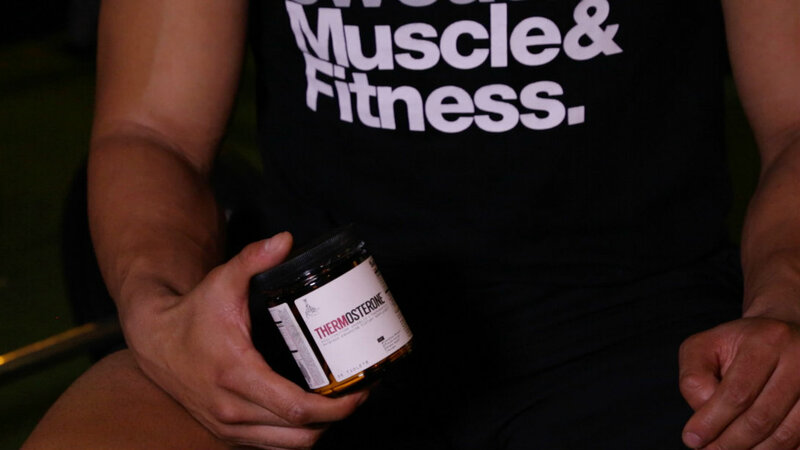 Helping add to the heat was the Thermosterone, which enhances thermogenesis so you burn more calories. Thermosterone also serve up some major pre-training energy that, no doubt, helped Mark power through four rounds of the circuit above. The alertness and concentration provided by the tablets also came in handy for this particular workout. Because this routine is high intensity and very technical, Mark needed to pay attention to proper form to get through the complex effectively and without injury. Each serving provides a strong dose that you can feel while you train—no matter how intense your workout is—all without the crash. While these benefits were fairly immediate, helping Mark power through his workout, Thermosterone has other benefits that take weeks of continued use to fully realize. In addition to the thermogenic properties, Thermosterone is also an anabolic that supports your body’s natural hormonal environment to help muscle growth. This dual-action tablet provides a combo of fat burning and muscle building—not unlike the barbell complex. For more on Out of the Lab’s Thermosterone, head to outofthelab.net. Thermosterone is intended for healthy active adults (18+) only. Before use, consult a qualified physician. Visit outofthelab.net for product directions and recommended use. Testing Ground is an all-new series where the M&F crew puts to test the latest workouts, supps and fitness products on the market. Check back for more Testing Ground videos soon.